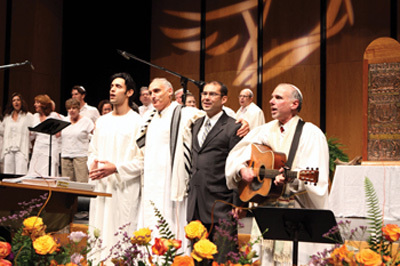 Muslim actor and prayer leader Ben Youcef, left, and the Islamic Center of Southern California’s Religious Affairs Director Turk, second from right, joined Rabbi Neil Comess-Daniels, right, and Cantor Ken Cohen, second from left, for Rosh Hashanah song and prayer at Santa Monica’s Beth Shir Sholom. In his sermon, “A Holy Place,” urged congregants to support the jewish muslim community building unity . Photo courtesy of Beth Shir Sholom / The Jewish Journal. "No one who has not heard it before is prepared for the sound of Islamic prayers being chanted. Abdelwahab Ben Youcef in his long white garb startled many with a new and haunting sound." Ben Youcef sang Suso’s stirring call to prayer... that made this "Powaqqatsi" uniquely moving and important. 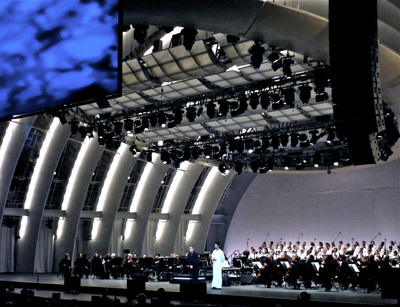 Performed with Oscar winning composer Philip Glass and the La Phil in front of a delighted crowd of 18,000 at the Hollywood Bowl in Los Angeles California. Cantor Mark Saltzman from Temple Kol Ami in West Hollywood (left). 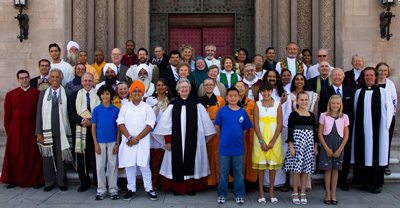 Ed Bacon, the rector of All Saints Episcopal Church in Pasadena (center). Abdelwahab Ben Youcef of the Omar Ibn Al Khattab Foundation in Los Angeles (right). Ben is a Muslim Muezzin who frequently leads the call to prayer at the Southern California Islamic Center as well as at the Interfaith Service for Peace, attended by Muslims, Christians and Jews. Ben is a passionate supporter of Uniting Humanity & Peace for all God's children. 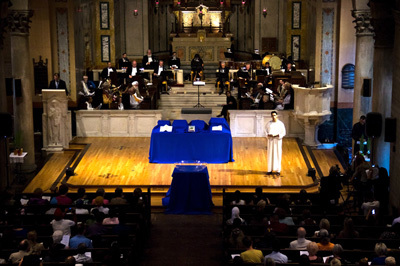 Ben Youcef leading prayers at the Interfaith Service for Peace. Ben Youcef in an interfaith Abrahamic blessing. Ben Youcef leading prayers on MSNBC (Islam in America). Ben Youcef performing in Born Again American.